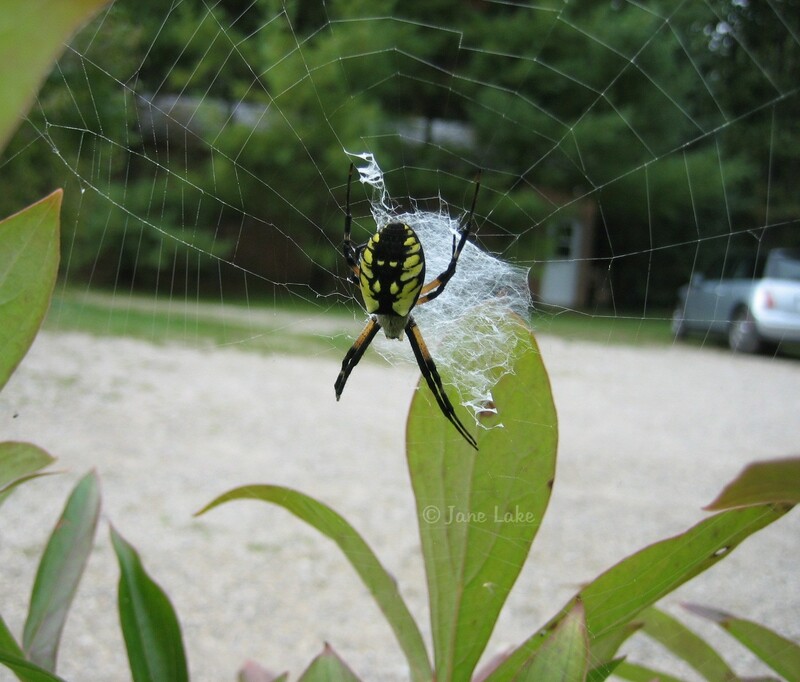 If you see an incredible spider web that you want to preserve, you’ll find an easy way to do that here. Common garden spider on a peony plant. 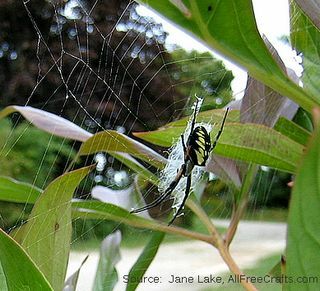 Spider webs are fascinating and have existed on earth for over 100 million years. 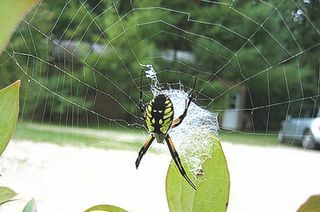 They are made from the silk that spiders spin from spinneret glands; most spiders have three pairs of spinnerets, with each pair producing a different type of silk. After all, a spider building a home to trap and store food will need sturdy construction rope, adhesive binding for prisoners, and smooth silk for wrapping lunch. Back view of a garden spider waiting in the middle of its orb web for lunch to appear. When the spider had left, I held adhesive-sprayed card stock behind the web then gently moved it forward to mount the web permanently on the card. This common garden spider made a spiral orb web in a peony plant that had to be dug up and moved. I decided to gently move the spider to another spot and to save and frame the spider web before it was destroyed. 1) Find a spider web of suitable size that is also accessible from the back. 3) Choose a calm, still day to capture the web. Blow gently on the spider to make it move away. When you do this, the spider will usually leave the web and quickly hide or it will drop to the ground and scuttle away. 4) Shake the can of spray paint and make a practice spray in the air. You will need a very fine mist of paint. Too much paint will break the web. Shake the can again and hold it at least 18 inches, or 1-1/2 feet, away from the spider web. Begin spraying the web in as fine a mist of paint as you can achieve. Stop spraying (within seconds) as soon as you can see paint on the threads of the web. 5) Position yourself so that you can hold the card stock on one corner, or on the edges, and slide it behind the web. When you are ready, spray the card stock with a light coat of adhesive spray and carefully slide your hand and the card stock into place behind the web, being careful not to break any of the main support lines. When you have the spider web centered as you would like it, gently move the sticky card forward onto the web. You will only have one chance to do this, because as soon as any thread of the web has fastened to the card, all the rest must follow immediately. Garden spider hanging upside down in its orb web. 6) Run the fingers of your hand over the edges of the card to release any remaining threads and bring the mounted web indoors. Allow the paint to dry for half an hour, then place it on the glass of the picture frame and return the backing to the frame. 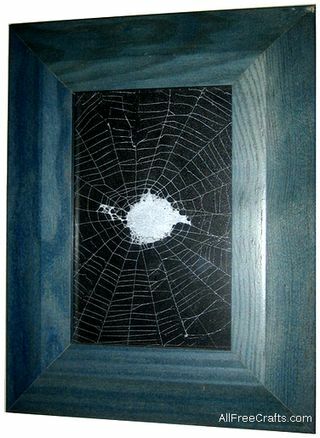 Fasten the backing in place with the pins or tabs provided with the frame, then hang your spider web art on the wall. Make a photo essay of a spider web, beginning with macro closeups of the spider and accompanied by identification and research into the spider’s classification and habits. 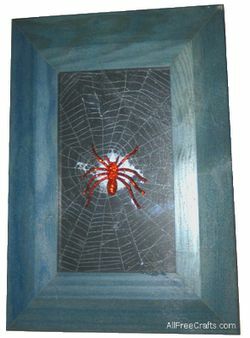 Mounted and framed, your spider web can be the beginning of an awesome Halloween decoration. Just add a drop of tacky glue to the feet of a fake Halloween spider, then position it on top of the picture glass, in the middle of the web, and let dry before hanging on the wall. You could also festoon the frame with wispy fake spider webs as well. After Halloween, simply remove the spider and any artificial webbing, clean the glass, and hang the web back up. I’m going camping in a couple of days and will be trying this for the first time. I bought stick glue to use instead of spray adhesive. Will this still work out OK? Or is the project doomed? Thank you for Your time and for taking the time to reply back to me. Hi, Irish, I can see why stick glue is more appealing when you’re camping, but I’m not really sure how well it will work. Spread the glue evenly, in a very thin layer on your mounting card and try it! I might also try skipping glue altogether and relying on just the spray paint to stick the web to the card. This could work even better if you replaced the card stock with a sheet of stiff felt which would help the painted web stick in place. Good luck, and let me know how it goes. why “digital”? an old 35mm not good? Old 35mm cameras are great – if you know how to use them, have the money to develop the film, and are talented enough in photography to take the perfect photo. My husband loved his 35mm camera and took many photos with it. But he admits the digital cameras are easier and cheaper to use.